Woods Point is a tourist and former gold-mining township in the Great Dividing Range, 120 km north-east of Melbourne, and a considerably longer distance by road. It is situated at the extreme headwaters of the Goulburn River on the northern side of the range. About 20 km to the south are the headwaters of the Jordan and Thompson Rivers, which drain the other side of the range. 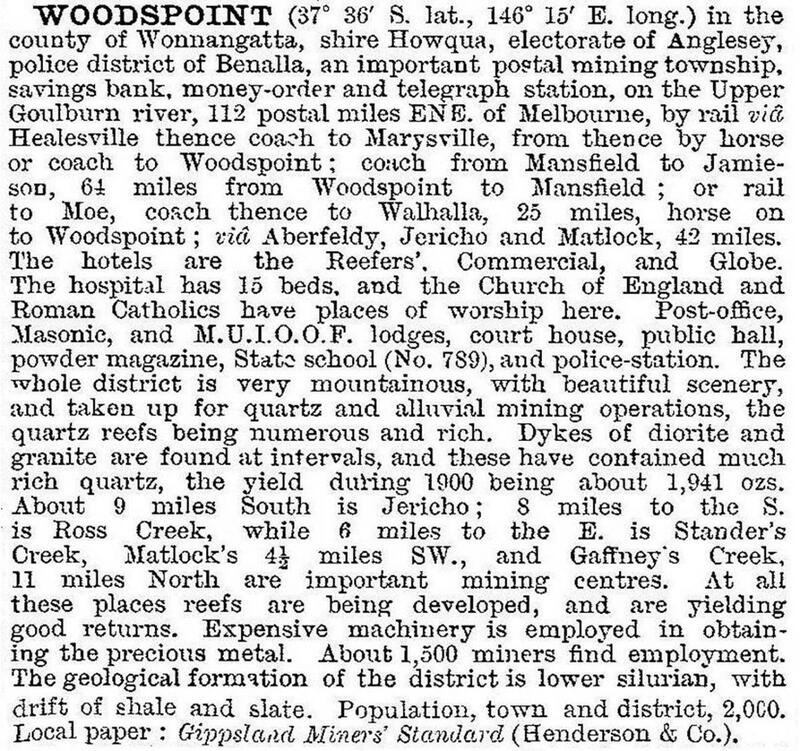 Woods Point was part of the Jordan goldfields, and two access tracks were cut from Melbourne and two from Sale, Gippsland. The tracks intersected at the Jordan. Prospectors found gold at Jamieson in 1857 and Gaffneys Creek in 1859. In the middle of 1861 William Gooley discovered gold in Gooleys Creek, a few kilometres south of Woods Point. Shortly afterwards the Morning Star reef was found, and in 1862 an American, Mabille (Harry) Wood built a store near the river. It became known as Woods Junction, later resulting in the establishment of the Woods Point township. By then the Jordan goldfields had been discovered. Several reefs at Woods Point gave rich yields and the township was quickly formed. Within a few years it had a post office, a police court, a hospital, a school, three churches, three banks, two newspapers, three breweries and numerous shops and hotels. Prodigious wealth was earned from the mines, but it was mostly spent on costly consumer goods and on prospecting for new claims. Little was kept aside for capital investment for deep mining in the established mines, and gold output fell by the 1870s, although maintained at a reduced level for several years. Woods Point was proclaimed a borough on 5 May 1865. It was merged with Howqua shire on 25 May 1894, at a time when gold production had fallen away. After several years of inactivity the Morning Star mine was reopened with government assistance, in 1916. The results were good and population flowed back to Woods Point for a few years. The mine was intermittently reworked from the 1930s to the 1960s. Other mines were also reworked and some timber from the forests was milled. In 1939 the Ash Friday bushfire destroyed all but seven of the 150 buildings at Woods Point. Residents lived in tents and rebuilt a town of reduced size. The Morning Sun mine closed in 1963. Woods Point is now chiefly known as a venue for four-wheel-drive tourists, bush walkers and horse riding. The town has several holiday houses, a memorial hall, hotel, community health centre and a post office. Until 1998 the school was kept open because rain and snow can block the road to the nearest other school at Jamieson.